Lately, there has been a lot of press about a "new" technique called "Laser Liposuction", sold under a number of clever brand names, including SmartLipo™ (who would want "dumb lipo"?) and the ironically-named CoolLipo™. Unfortunately, these machines have been introduced primarily as marketing tools without any evidence that they are superior to standard liposuction. (When they say "FDA approved", they mean that the FDA has evaluated them for safety and similarity to other, already approved machines, not for efficacy, and certainly not for superiority to another technique.) However, I am starting to see patients in my practice who have been harmed by them, and it is time to share my concerns. The goal of laser liposuction is nothing less than the "holy grail" of plastic surgery: to be able to reliably and safely tighten the skin without the scars that result from actually removing skin (as in many "lift" procedures, such as facelift, blepharoplasty, breast lift, tummy tuck, etc.) Many other techniques have been introduced through the years trying to produce skin tightening with generalized, controlled tissue injury. Those include facial laser resurfacing (burning the outer layer of the skin with a laser), fractional facial laser resurfacing (burning only a fraction of the outer layer of the skin in a pattern), ultrasonic liposuction (which uses ultrasonic energy to disrupt the fat), and Thermage® (which attempts to cause injury with electrical current passing through the tissues). I recently attended a seminar given by one of the laser liposuction manufacturers because I wanted to evaluate this technology and determine if it might be helpful to my patients. I was under the misapprehension that they were claiming that laser liposuction would, by heating the deeper tissue, cause contraction and tightening of the tissues. However, I quickly learned that "if you use the new tool with the same old technique, you will get the same old result". In other words, the speaker was admitting that merely using laser liposuction instead of standard, non-laser liposuction would not produce any improvement over the standard technique. Rather, the speaker was recommending the use of laser liposuction for superficial liposuction, very close to the undersurface of the skin. Now, the claims made more sense to me. Superficial liposuction has been around for a long time. I first learned about it at a seminar given in Los Angeles during the riots of 1992 (which is how I can remember the date!) The concept is simple: do suctioning right under the skin, produce a little scarring, and the scarring will tighten up the skin. However, most of us had quickly abandoned superficial liposuction because of its high risk of producing irregularities and bumps. But now, I discovered, it was back. These photos show two patients. I have not done surgery on either one, but both have given me permission to use their photos so that we could give other patients the warning they wished they had had. The first one (above and below) had laser liposuction of the inner thigh, producing a burn that blistered within a few days. Normally, a blistered burn (what Boy Scouts call "second degree", and burn surgeons call "superficial partial thickness") will heal fairly quickly. However, I knew that this burn had been caused from the inside, so it had to go all the way through the skin. Not surprisingly, the full thickness of skin subsequently died and scabbed. As they say in the movies, "that will leave a mark". The patient assured me that she had not been warned about the risk of burning the skin, although that clearly is a risk of this technique. The second patient (below) also had had laser liposuction, and came to see me both about the burns it had caused on her back and the irregularities it had produced. She particularly pointed to the irregularities at the upper part of her thighs just below the buttocks. She said that the doctor who did her procedure told her he would use "tiny incisions, so small they would not need to be sewn up". However, apparently he did not make the incisions large enough for the canula, and the friction of the canula caused the burns you see. Finally, the third patient (with the blue background below), is scanned from a paper provided by one of the manufacturers to show a comparison of laser lipo with standard lipo. The right side of the abdomen was done with laser, and the left side was suctioned without laser. I would point out that BOTH sides of the abdomen look bumpy, which is to be expected from superficial liposuction. And again, this is the ONLY comparison photo (laser vs. non-laser) that I have been provided by the manufacturers. They reported that they measured 18% shrinkage on the laser side, compared to 13% on the side with non-laser superficial liposuction, and they considered that a good result. My point is not that these doctors did the procedure incorrectly, but rather that these outcomes are expected from superficial liposuction combined with a laser. I'm sure there are many patients who have had laser liposuction who are happy, just as there are many patients who have had non-laser liposuction who are happy. However, you need to be aware of the risks of any procedure you are considering, and there are some special risks to laser liposuction. Additionally, fancy technology, especially when it can be done outside of the supervision of a hospital, tends to attract less qualified doctors who use it to compensate for their lack of credentials. For example, I recently learned of a cardiologist (!) who is now doing laser liposuction, despite not having ANY surgical training. By now, it should be clear that I do not do laser liposuction. Those doctors who do laser liposuction will say that I am just biased against it because I don't have a machine. However, if I really believed that laser liposuction was safe and effective, I would get one. And ask yourself, how objective can a doctor be about a non-returnable $130,000 machine with no resale market that he has bought (or, worse, that the manufacturer may have given him). 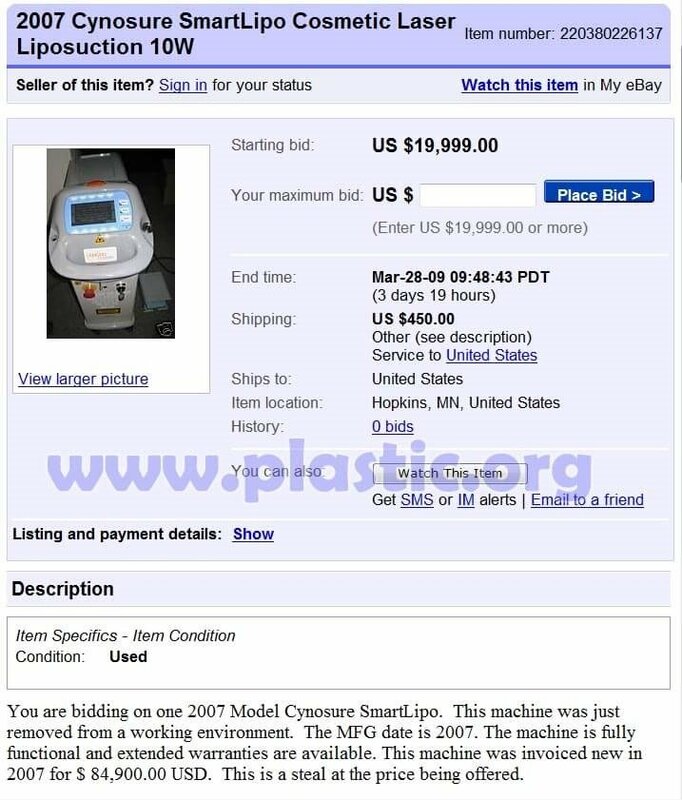 To see what I am talking about, look what I found a few years back when I searched "Laser Liposuction" at eBay. Talk about a troubled asset! They bought it for $85,000, are offering it at $20,000, and still have no bids. Ouch! And yes, this was an earlier machine. But what will this year's machine become next year? So, if you decide to have laser liposuction anyway, don't say you weren't warned. And if the doctor doesn't tell you about the risk of causing a burn with the laser, tell him about these pictures.